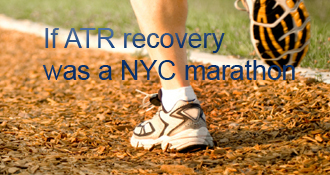 pendersnitzel has completed the grueling 26.2 ATR miles to full recovery! Anyone else have difficulty getting comfortable and to sleep in bed with the cast on…? Seems like I do better in a recliner/La-Z-Boy…. I’ve had a terrible time with sleeping - more with the boot than when I was in a splint. I’ve read of others getting a “night splint”, but since you are in a cast, that won’t do much for you now. If you are getting some sleep in the recliner, then I say stay in the recliner! Yes, that was a problem for me but eventually had a variety of pillows plus a folded single duvet so I could criss-cross them to vary the angle and elevation. Found I could sleep on my side more comfortably if I put a pillow between my knees. Whatever works. Yup, its tough to find the perfect position for the cast. I find I toss and turn all night. That’s interesting, Doug. My only measurement of my vertical jump, after my first ATR healed (10-11 months post-op), was how well I could spike a ball downwards, over a volleyball net. Using that rough measure, it seemed at least as good as it used to be. Mind you, I am left-footed, and I tore my RIGHT AT first, so maybe that wasn’t the best test. But it felt solid, and I never felt a deficit, either jumping or on floor defense (which is what actually tore both of my ATs). I’m currently “negotiating” with a couple of cardiologists over whether or not I’m going to return to competitive volleyball in the Fall, so I may have to delay the next test until I’m REALLY an old guy. . .
My jump is still an inch or two short of where it used to be. I’m starting to wonder if it will ever fully recover. It may be that my calf is fine, but the tendon itself is not the same elastic energy storage device that it used to be. I think the calf size (and “look”) depends on what you do. 8 yrs ago (first ATR) I worked at it a bit and returned to bicycling and competitive volleyball, and I think the difference vanished. I can’t check it now, because I tore the other AT, so now THAT calf muscle is the “funny” one! Interestingly, I didn’t lose hardly any calf-muscle circumference this time! But the part of the gastroc that projects medially, toward the other leg, is clearly smaller, so there must be extra mass in the back(?). Still working on strength at 21 weeks, though. If you “work” it, it will come. . .
Bob, if you’re still “here”, give us an update! Your interpretation of the latest studies is identical to mine (see my blog on the subject, with links) — and I took quite a while to complete my research! To follow up, I decided to forgo surgery and so far I’m happy with that. I was in a cast for 2 weeks and have been in adjustable splint for the past 2. I started with my foot at a 35 deg angle and and just got it moved up to 15 deg. I have a wedge fitted to my shoe and have started load bearing exercises that seem rather easy. Several factors went into my decision. 1) It was casted the same day I ruptured the tendon, which increases the likelihood of a good outcome; 2) The tendon ends were touching in the equinus position; 3) I intend to remain quite active, particularly cycling, but I’m 50 and have concluded this was one too many severe basketball injuries…won’t be going back for more; 4) I believe there is a great deal of misinformation floating around regarding the nonsurgical protocol. The results and recovery times are similar; 5) The top ankle/foot doc at the orthopedic sports medicine center I use did not hesitate when asked — He would not have surgery. The issue is controversial and the docs are not in agreement, but this is my take: The bias toward surgery is based on out-of-date and possibly misleading studies. You’re post just made my day…I am going back to my surgeon on Wednesday, and if all looks well I will get to PWB to whatever I can tolerate. It is so great to hear success stories. Congrats! I know this milestone is HUGE freedom. Live it up! My wife wouldn’t let me go to the Broncos pre-season game the evening after I ruptured - they can be kinda controlling, eh? Yes, as I get out and about I do develop a bit of swelling around the ankle and foot, as well as along the AT. I find that after getting out, and if possible while out, I elevate my foot and the swelling goes down fairly quick. My surgeon gave me a prescription for TED Hose (a form of compression sock but they go a little higher) and said it will keep swelling and fluid down a bit and enhance better circulation. Swelling seems to inhibit blood flow, which in turn slows down healing. Congratulations! I just got into the boot last week and you’re absolutely right; being able to take it off and let the foot breathe is indeed a wonderful thing. I’ve been having some swelling around the foot and ankles, just wondering if you’re experiencing them too? Hope you have a speed recovery! Bob- I’m 45 and ruptured 2 mos ago. You can check out my blog for all of the details: achillesblog/ultidad. I am an anesthesiologist and will readily admit that I subscribe to the notion that “a chance to cut is a chance to cure”. When my surgeon was explaining the non-operative vs. operatice options, I nearly cut him off when he was talking about the non-operative part. He didn’t even need to tell me the statistics or answer the “what would you do if it were you?” question. If he’d have said that he could operate on me right away, I would’ve jumped at it. As is was, I had surgery the next day. So, I’ll admit to having a pre-rupture bias towards surgery, but there was no way that I could’ve dealt with the duration of NWB that the non-operative route requires. So I say definitely have surgery. I had an acute rupture last Thursday playing baskbetball after a long layoff. I’m 50 and have been very active…road cycling, skiing, and exercise equipment. I iced it immediately and was able to see the specialists at a university sports medicine complex. The surgeon prefers surgery of course but the others all recommended nonoperative treatment. Under ultrasound the gap is small (8 mm) and the ends are touching in the casted position. I need to let them know today if I want surgery but am leaning against it now. The nonoperative protocol specifies removal of the cast within 2 weeks followed by the boot with some load bearing within 4 weeks. I am still concerned about getting an optimal result. I probably will be avoiding bball again but want full performance in everything else. Someone please talk me into surgery! I would guess that this approach is going to take quite a long time and that because of the casts you would be on crutches for many months. The longer your leg is immobile, the more muscle mass you lose and therefore the longer it will take to get it back once you can start PT. There was never any question for me, surgery was my choice, although that did become complicated by infections but most people here haven’t had to deal with that. Find out what their plan is with and without surgery: how long to PWB, FWB, 2 shoes, start of PT, etc. Then decide based on how soon you want to stop being an invalid. And if they only use the conservative approach after surgery, go find another doctor who doesn’t believe in that foolishness. I would not elect surgery unless it were deemed absolutely absolutely necessary. This is some good stuff…..I don’t think that physicians do a good enough job of explaining this to a lot of people. pendersnitzel - As mentioned in the other comments, the conservative treatment method relies on casting your foot in a downward angle which places the tendon in its shortest position. This brings the tendon ends into close proximity. Collagen forms around the rupture site and within any gap between the tendon ends, essentially fusing the two ends back together. The tendon heals the same way with surgery but with the advantage that the surgeon can physically align the ends of the tendon, reducing the chances of a gap between the tendon ends. However, there are plenty of studies that indicate the conservative method can be just as effective as surgery for complete ruptures. Here’s my understanding: there is a sheath that surrounds the tendon and muscle (think the thin, shiny stuff on the edge of a steak). This sheath remains intact - unless you’re one of the unfortunates who are cut with something external. My stating that the sheath stays intact is based on my surgeon’s op report that he incised the sheath to get to the tendon. When the tendon ruptures, there is some bleeding. If the ankle is immobilized and the gap is made the smallest possible, then as the blood goes through the healing process the two ends of the tendon are drawn together. As all of us who have reached a certain stage know, the period of mobility causes the muscles to atrophy, helping to greatly decrease the tension on the healing tendon. Having just chosen to go the conservative route, my understanding is that when they put on your first cast, the foot is angled downwards to push the two broken ends of the AT together. Despite the great tension in a healthy AT, when it ruptures the loose ends are often close enough to be put in contact, allowing them to join. At least I hope that’s the case with me! I read (on the net) that the ruptured tendon reforms using scar tissue to make the bond between the tendon ends, the tendon itself does not fuse together. I was treated by conservative method & it seems to be working (fingers crossed!). Just came across this blog and am relieved to learn I’m not going crazy! I can fully relate to this ‘bony’ pain you talk about. I’m four month’s post op following a debridement and osteotomy to treat Hagglund’s deformity. The procedure seems to have helped the tendinosis symptoms, but I’ve got this ‘bony’ protrusion underneath the scar on the heel and it hurts like hell. At first it was explained by a dissolving suture that hadn’t dissolved, and they went back in there to dig it out. This helped for a while, but it seems that if I wear shoes that rub on the heel, the bump gets bigger. What’s going on? Will this get better? Do I need to see my surgeon again? Stitches are always nice to be rid of, I think I dreaded having mine pulled more than just about anything (except my first trip to the hospital). The heel pain will be with your for a while. Its not the same kind of pain that comes with an ATR, it feels bony. I’m associating mine with the suture pins that they put in place in my calcaneous on either side of the tendon, depending on the procedure they followed to remount your achilles you could be facing more initial discomfort that will disappear more quickly. If I had it to do over I’d be asking for a new MRI at each milestone - when stitches come out, going into the boot and then going two shoed, just for my own peace of mind. If you can convince your surgeon (and I’m guessing insurer) that its a good protocol go for it. Congrats — that sounds good that you can go to 90 degrees without any pain. I’ll have my appointment monday. That is nice, a neat straight line, few gathers, nice and even tension. Looks like we had the same surgery, the same day. Glad you didn’t have pain too much. I sure did - for the first two days after surgery I was eating as many of those little white pills as I was allowed. Pendersnitzel: I am glad to hear that you are through the surgery and all that is left is healing and strength building. Happy healing! Thanks for asking…Really doing well. They sent me home with a Q Ball nerve block that blocked all sensation from knee down through foot. Lasted 48 hours–no pain. But, the “Q” ran out, had some discomfort and since Friday have only taken 2 Lortabs and a couple of Tylenol X Strength. Went to Doctor yesterday (Monday) and he took splint off and put in a small cast (has foot at 90* angle) til next Wednesday–return to get stitches out then. So far, so good. I am happy and hoping for good results from surgery. How are you recovering after the surgery? First day was bad with pain and pain killers. I can tell you I have been in cast for 7 weeks in the spring, I lost 2cm of circ. of the calf, and with a 2nd rupture and 5 more weeks of cast another 2 cms…. So barely more than the difference you have now. Thanks, I found Debra’s blog. She had exactly what I have and I will follow her closely. Pendersnitzel: Did you check out Debra’s latest post titled, “Heel Spur Surgery”? There are several of us that have had versions of the surgery you are headed for. When is your surgery scheduled? Hang in there. I had surgery on June 1 and I’m taking steps around the house right now. You will get better and I believe thankful that you decided to get the procedure. Are the Saints going to have a team this year? At least with the left foot in cast you can drive an automatic car, lucky you! Stock up on DVDs and good books. Roy’s Achilles Heel is proudly powered by WordPress and WPDesigner..